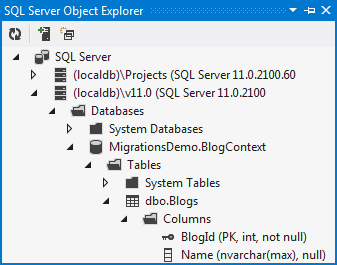 Run your application and you will see that a MigrationsCodeDemo.BlogContext database is created for you. As the exception suggests, it’s time to start using Code First Migrations. The first step is to enable migrations for our context. An InitialCreate migration. This migration was generated because we already had Code First create a database for us, before we enabled migrations. The code in this scaffolded migration represents the objects that have already been created in the database. In our case that is the Blog table with a BlogId and Name columns. The filename includes a timestamp to help with ordering. If the database had not already been created this InitialCreate migration would not have been added to the project. Instead, the first time we call Add-Migration the code to create these tables would be scaffolded to a new migration. When using versions prior to EF6, only one Code First model could be used to generate/manage the schema of a database. This is the result of a single __MigrationsHistory table per database with no way to identify which entries belong to which model. Starting with EF6, the Configuration class includes a ContextKey property. This acts as a unique identifier for each Code First model. A corresponding column in the __MigrationsHistory table allows entries from multiple models to share the table. By default, this property is set to the fully qualified name of your context. We need to scaffold a migration to take care of the new Url property we have added. The Add-Migration command allows us to give these migrations a name, let’s just call ours AddBlogUrl. We could now edit or add to this migration but everything looks pretty good. Let’s use Update-Database to apply this migration to the database. Code First Migrations will compare the migrations in our Migrations folder with the ones that have been applied to the database. It will see that the AddBlogUrl migration needs to be applied, and run it. The MigrationsDemo.BlogContext database is now updated to include the Url column in the Blogs table. So far we’ve generated and run a migration without making any changes. Now let’s look at editing the code that gets generated by default. We'll use the Add-Migration command to let Code First Migrations scaffold its best guess at the migration for us. We’re going to call this migration AddPostClass. Run the Add-Migration AddPostClass command in Package Manager Console. First up, let’s add a unique index to Posts.Title column (Adding in line 22 & 29 in the code below). Our edited migration is ready to go, so let’s use Update-Database to bring the database up-to-date. This time let’s specify the –Verbose flag so that you can see the SQL that Code First Migrations is running. So far we have looked at migration operations that don’t change or move any data, now let’s look at something that needs to move some data around. There is no native support for data motion yet, but we can run some arbitrary SQL commands at any point in our script. Let’s add a Post.Abstract property to our model. Later, we’re going to pre-populate the Abstract for existing posts using some text from the start of the Content column. We'll use the Add-Migration command to let Code First Migrations scaffold its best guess at the migration for us. Run the Add-Migration AddPostAbstract command in Package Manager Console. Our edited migration is looking good, so let’s use Update-Database to bring the database up-to-date. We’ll specify the –Verbose flag so that we can see the SQL being run against the database. So far we have always upgraded to the latest migration, but there may be times when you want upgrade/downgrade to a specific migration. Let’s say we want to migrate our database to the state it was in after running our AddBlogUrl migration. We can use the –TargetMigration switch to downgrade to this migration. Run the Update-Database –TargetMigration: AddBlogUrl command in Package Manager Console. This command will run the Down script for our AddBlogAbstract and AddPostClass migrations. If you want to roll all the way back to an empty database then you can use the Update-Database –TargetMigration: $InitialDatabase command. If another developer wants these changes on their machine they can just sync once we check our changes into source control. Once they have our new migrations they can just run the Update-Database command to have the changes applied locally. However if we want to push these changes out to a test server, and eventually production, we probably want a SQL script we can hand off to our DBA. Run the Update-Database command but this time specify the –Script flag so that changes are written to a script rather than applied. We’ll also specify a source and target migration to generate the script for. We want a script to go from an empty database ($InitialDatabase) to the latest version (migration AddPostAbstract). If you don’t specify a target migration, Migrations will use the latest migration as the target. If you don't specify a source migrations, Migrations will use the current state of the database. Code First Migrations will run the migration pipeline but instead of actually applying the changes it will write them out to a .sql file for you. Once the script is generated, it is opened for you in Visual Studio, ready for you to view or save. Starting with EF6, if you specify –SourceMigration $InitialDatabase then the generated script will be ‘idempotent’. Idempotent scripts can upgrade a database currently at any version to the latest version (or the specified version if you use –TargetMigration). The generated script includes logic to check the __MigrationsHistory table and only apply changes that haven't been previously applied. If you are deploying your application you may want it to automatically upgrade the database (by applying any pending migrations) when the application launches. You can do this by registering the MigrateDatabaseToLatestVersion database initializer. A database initializer simply contains some logic that is used to make sure the database is setup correctly. This logic is run the first time the context is used within the application process (AppDomain). We can update the Program.cs file, as shown below, to set the MigrateDatabaseToLatestVersion initializer for BlogContext before we use the context (Line 14). Note that you also need to add a using statement for the System.Data.Entity namespace (Line 5). When we create an instance of this initializer we need to specify the context type (BlogContext) and the migrations configuration (Configuration) - the migrations configuration is the class that got added to our Migrations folder when we enabled Migrations. Now whenever our application runs it will first check if the database it is targeting is up-to-date, and apply any pending migrations if it is not.